The last thing a drum corps fan might expect to hear during the dog days of summer are strains of "Have Yourself a Merry Little Christmas" coming from a drum corps' brass section. But believe it or not, this tune and many others with a holiday twist have been heard during DCI competitions over many years! Just in time for tree-trimming and family gatherings in front of the fireplace, we've re-released a special audio bundle that captures many of these holiday-themed performances. 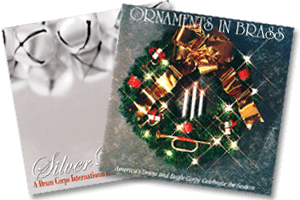 Combining two sets of popular holiday tracks, "Silver Bells" (a collection of "classic cuts" from corps performances spanning 1973-2006) and the 1993 "Ornaments in Brass," this sparkling collection of 24 MP3 downloads will make a great addition to your playlists this winter season. Purchase this holiday collection on the DCI Fan Network.